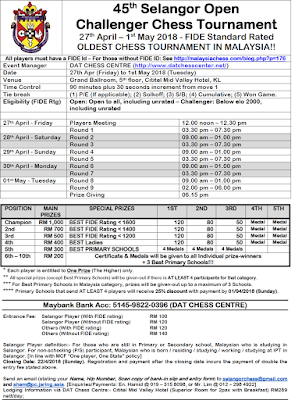 CAS will be organizing the Oldest Chess Tournament in the country from 27th April to 1st May. This year we will be celebrating 45 continuous years of our event that has a very colorful history since its first inception in 1974. This event will be divided into 2 Categories i.e. an Open Section and a Challenger Section. This 9-round Open Section with the time control 90 minutes plus 30 seconds increment from move 1 that comprises of RM 21,000/= in cash for the Top 20 winners (Champion RM 6,000), plus another RM 3,000/= in cash awaiting 15 winners in Special Prizes, and 12 Medals for the Best Schools / IPT in Malaysia. This Open section is open to all. 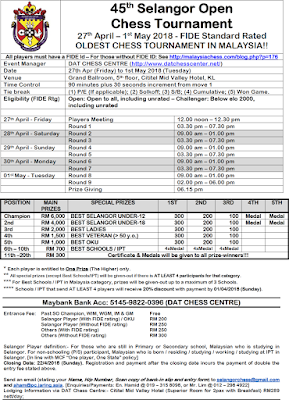 Free entry shall be given to any WIM/WGM/IM/GM and past Selangor Open Champions who sign-up. On top of that, the first 4 Grandmasters (GM) who confirm their participation shall be provided with 5 nights accommodation @ Cititel Hotel (on twin-sharing basis). 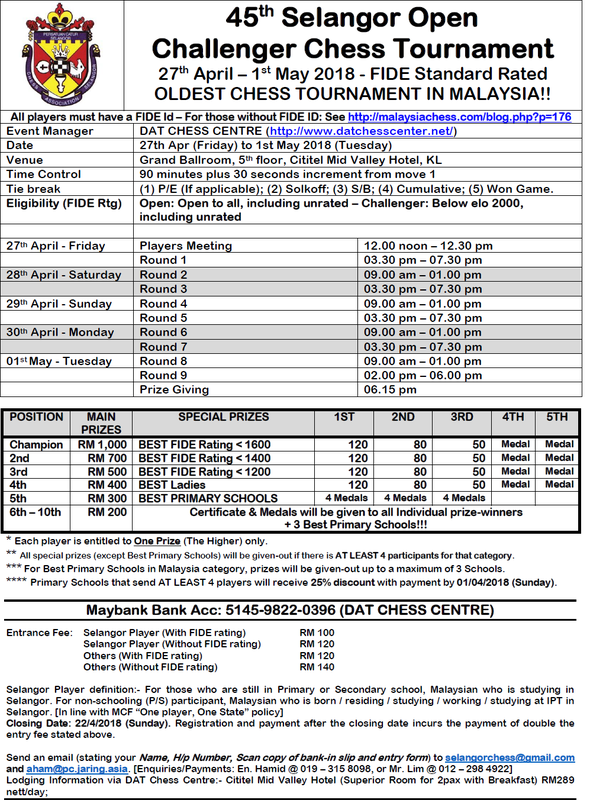 While, the Challenger Section with the same number of rounds and time control with RM 3,900/= in cash for Top 10 winners, RM 750/= in cash awaiting 9 top winners from FIDE Rating Ceiling categories and 3 best Ladies, and 12 Medals for Best Primary Schools in Malaysia. The venue for this event is at Grand Ballroom, 5th floor, Cititel Mid Valley Hotel, KL. Any outstation participants who need accommodation at Cititel Hotel, please alias with En. Hamid Majid (aham@pc.jaring.asia) at special rate (One night twin sharing with breakfast @ RM289 nett). Alternatively, you can book the room via one of the online web portals. CAS has appointed DAT Chess Centre as Event Manager for this event. DAT Chess Centre will be handling the Registration and Payment processes. 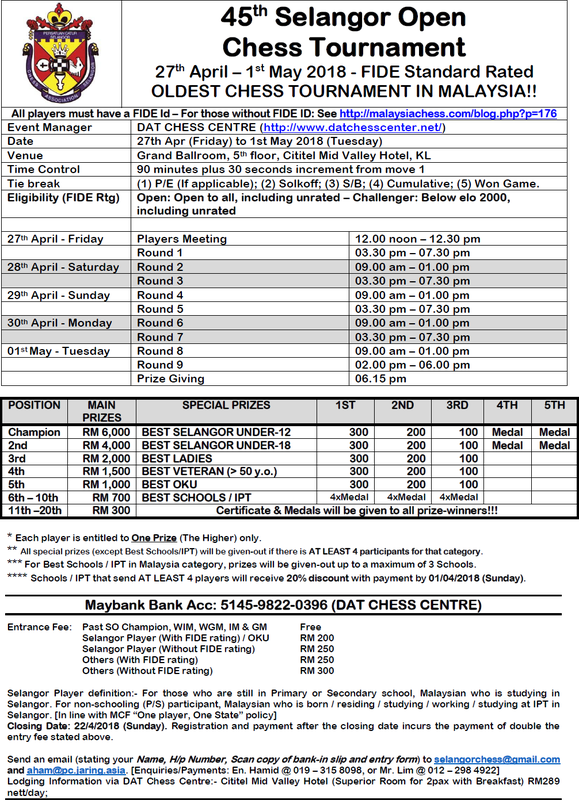 All payments shall be paid into DAT Chess Centre Maybank account: 5145-9822-0396. Rebate shall be given to players who register with payment for OPEN section, both Individual and (4 and above from the same school) School-going Children for OPEN section, and (4 and above from the same school) School-going Children for CHALLENGER section By 1st April 2018 (Sunday). While, OKU participants who take part in OPEN Section is entitled to lowest bracket rate in Individual entrance fee of respective category based on the timeline of registration. You may download a copy of the OPEN Section prospectus or the Challenger Section prospectus.